The place with the funny name has everything you need (and even things you don't) for gifts this holiday season. I have loved including products from them in my Holiday Gift Guide each year. They make quality products that are built to last plus I have such a hard time choosing just one item I would like! I have been wanting a tree in my every room in my new house, starting with the dining room, since we moved in over two years ago. 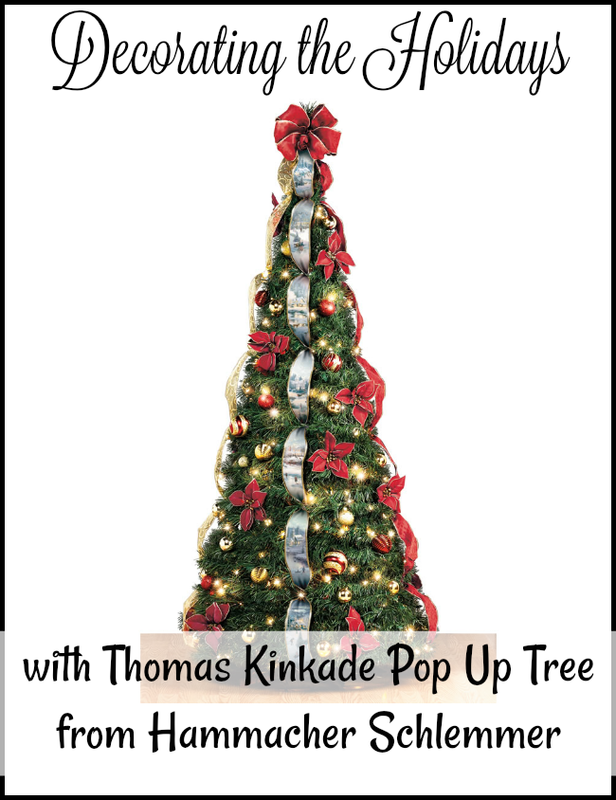 So when choosing an item from Hammacher Schlemmer, I decided on The Thomas Kinkade Pop Up Tree. About it: "This is the 6' Christmas tree that pops up instantly and is pre-decorated with original artwork by renowned holiday artist Thomas Kinkade. The one-piece tree rises from a flat position in concentric circles into its full 30" width and 76" height and simply hangs on the included stand and its pole, eliminating the hassle of assembling multiple sections. The fully decorated tree has two satin-like ribbons with winter holiday scenes inspired by Thomas Kinkade’s original artwork. Two hundred glistening clear lights are nestled among the branches and cast a warm glow onto 46 globe ornaments that are painted in rich holiday red and gold. The tree has two additional gold and burgundy ribbons, 15 velvet-like poinsettias, and a gold-trimmed bow tree topper. The tree collapses just as easily to a mere 5" H for easy off-season storage." What I love about it is how easy it was to assemble. In the video below, you can see my husband read the directions only because he was confused at how easy it was to setup! He honestly thought there would be more to it, but he had it figured out without even reading the directions at all. The details on the ribbons are truly Thomas Kinkade works of art and give the tree that special touch. There are so many other great items to choose from at Hammacher Schlemmer. Another favorite for this year was The Disney Princess Slipper Ornaments. What do you think of this tree from Hammacher Schlemmer? What item would you choose from their catalog? That's an amazing tree. And so easy to set up. Hammacher Schlemmer always has the most beautiful gifts. I always enjoyed their Christmas catalog.